As the racing season begins to ramp up for us Canadians, it is nice to start with a few local, fast, flat events. 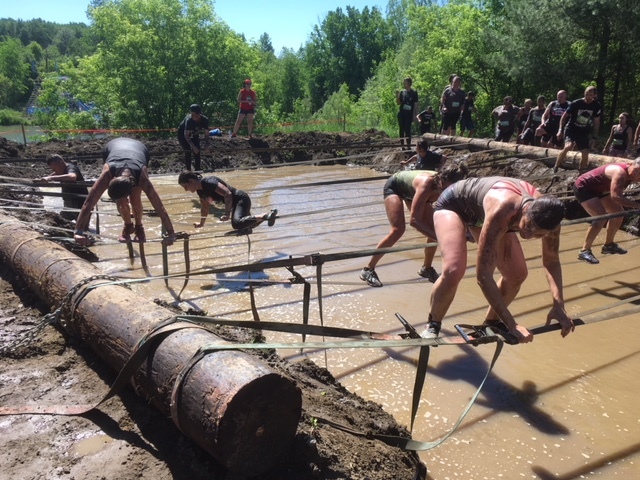 We headed off to Mud Hero in Ottawa, Ontario to the excellent location at the Commando Action Centre, if you get a chance to check out their website the drone overhead shots are FAB. Parking was $10.00 per vehicle and there were no lineups to get in and the adjacent fields offer ample parking for the 2000 attendees. If you do arrive late, be forewarned that there is no parking along the highway and vehicles risk being tagged or towed away at their own expense. 365Sports really knows how to layout an excellent village where you are motivated with music, excitement and the powerful energy of racers coming and going throughout the day. This year was even better managed, and we had little to no wait to get our timing chip, race kit, and black Mud Hero tee shirt. We stored our gear for a minimal fee of $5.00 and again the funds raised went towards the Special Olympics. 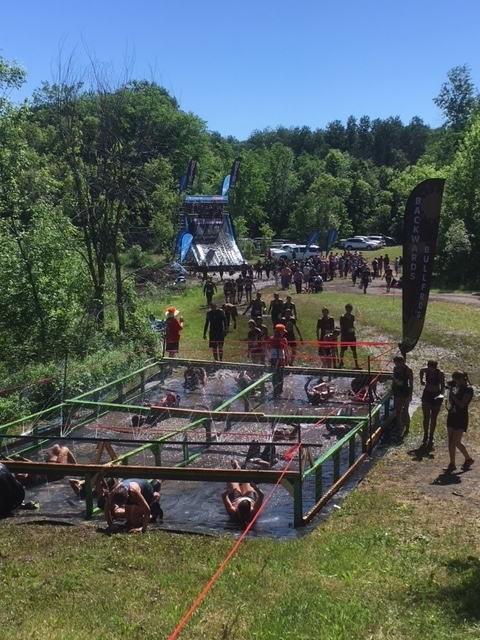 This year we opted for the 08:30 heat so we could ensure that we were ‘timed’, hoping to qualify for the North American OCR Championships being held in August in Stratton, Vermont, USA. For more information on qualifying check out their website. After a brief warm-up and ‘pump you up’ music fest we were set free as we looped out and into the woods, looking forward to the 6KM course that lay ahead. As this will be our 5th or 6th year participating in this event, we have high hopes and great expectations for those obstacles that we love to hate and others that we hate to love. It is a great blend of racers from the young beginner racers who opted to try the kid’s version, located at the main village, to those who are still young at heart participating at the age of 78 -the M/C announced that this ‘oldest’ competitor plans on attending every Mud Hero across Canada this year, and from what we saw out there, he will achieve it, tackling obstacles with apparent ease. This year was the traditional bibs, and we opted to add our numbers to our arms with sharpies as the deep mud pit covers racers head to toes and only partially rinses off during the back-crawl portion, many it difficult to see race numbers. The village is well laid out and you can enter a draw with Goodlife Fitness and interact with other sponsors while enjoying a free McCafé. The finish line is tons of fun as racers squirm through a deep muddy pit and try to crawl out for that bottle opener bling. Spectators had many great spots to sit and enjoy the fun as racers plunged down the fast water slide into the muddy depths or while they tried to balance between two hoses over a murky pit of muck. 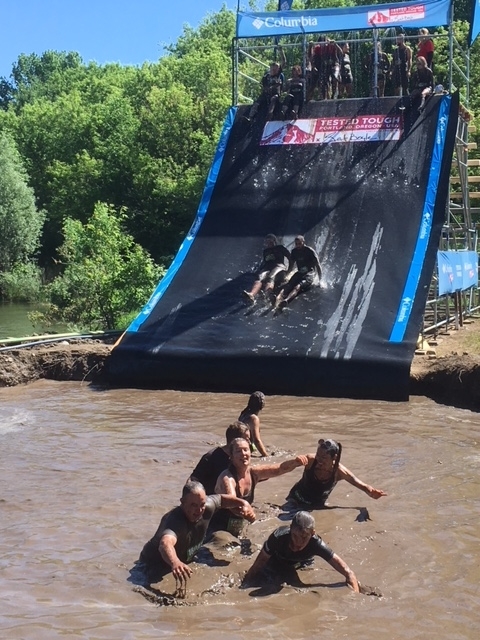 It was nice to see a few new obstacles including the Platinum Rig and submerged walls to keep us on our toes and there was still the old traditional walls, crawls, climbs and muddy bliss the entire course. There were well-placed toilets and the showers this year were well designed and offered plenty of space to clean up and lots of water pressure to really get to those dirty bits. The change rooms and showers also offered racers free Glad bags to toss their wet clothes into and you could drop off old shoes to be sent to charitable organizations overseas. Flip flops were the footwear of choice to easily pop on and off while coming and going to the shower area. Zoomphoto.ca provides free photos to everyone, and there was a pro photographer near the main inflatable that took your photo just after you exited with your medal, so you could search by your number easily online. This is a great event for first timers and family friendly! The BBQ afterwards is reasonably priced and has one of the largest condiment bars I have ever seen, with each item protected against flies with see-through covers. It was a nice to have a free beverage ticket with your entry fee and was great to sit and watch the crowds in the picnic area. Security guards check everyone’s ID and provide a wristband to those that are old enough to drink allowing everyone access to this area without issues. For those wanting more of a challenge, they could tackle the 10K Ultra or opt for the ‘hard’ lane that was offered at various obstacles along the course. 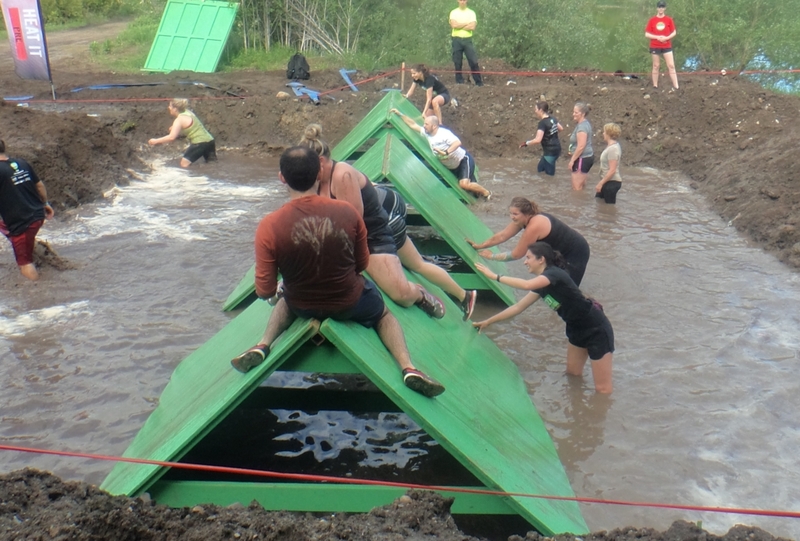 Swim through the two large mud pits to avoid getting stuck. Thanks to the organizers and many volunteers who really demonstrated how to put on a great event! Have you done an Mud Hero?